You can add references to node, to reference to both internal and external resources such as a shape, a diagram, a file, a URL, etc. For example, to make a node Prepare Agenda link to a document of agenda template. This makes a mind map more informative by providing additional information from a mind map which might be casually developed. 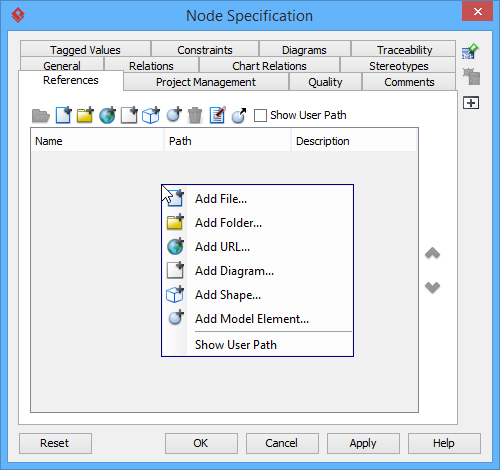 Right click on the node you want to add reference and select Open Specification... from the popup menu. In the node specification, open the References tab. Right click on the center of pane and select the type of reference to add from the pop-up menu. Diagram A diagram in the opening project, such as a requirement diagram. Shape A shape in the opening project, such as a use case shape on a use case diagram. A model element in the opening project, such as a use case. Supply the information of reference such as the file path of a file reference, a diagram for a diagram reference. Once a reference has been added, you can open it from the References tab by right clicking on it and selecting Open... from the popup menu.